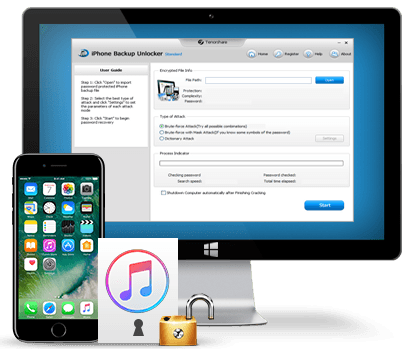 Instantly Unlock iTunes Backup File Password for iPhone, iPad and iPod Touch! Recover lost contacts, photos, SMS from iPhone without backup, form iTunes backup or from iCloud backup. Extract and recover all lost data on red iPhone 7/SE/6s/6/ 6 plus/5s/5c/5/4S, iPad Air 2/Air/mini 2/4, iPod Touch 5g/4g from iTunes backup. Choose the most appropriate iPhone software for you! iPhone: red iPhone 7, red iPhone 7 Plus, iPhone SE, iPhone 6s, iPhone 6s Plus, iPhone 6, iPhone 6 plus, iPhone 5s, iPhone 5c, iPhone 5, iPhone 4s, iPhone 4, iPhone 3gs, etc. iPad: iPad Air 2, iPad mini 3, iPad Air, iPad mini 2, iPad with Retina display (iPad 4 ), iPad mini, The new iPad (iPad 3), iPad 2, etc. iPod: iPod nano (7/6 generation), iPod touch (5/4 generation), iPod shuffle (4/3 generation), iPod classic, iPod photo, iPod mini, etc. ""All the data on my iPhone 5s disappeared after iOS 7.1.1 update. Fortunately, I found this software. And use it to retrieve all the data. Fantastic tool!"